Identification: This species is translucent white with pale-yellow tubercles on its notum connected by low ridges and a network of yellow-orange lines. Thin, yellow-orange lines edge both the mantle margin and the foot. The rhinophores and gills are translucent white densely spotted with black. Natural history: Halgerda terramtuentis is a common species found in rocky areas and on shaded cavern walls. Rarely it is seen crossing open sand. It occurs at moderately exposed to highly exposed sites at depths of 1.5-43 m (5-140 ft). Bertsch and Johnson, who described this species, often found it on a yellow sponge. It lays a bright yellow egg mass. Distribution: Big Island, Maui, Lanai, Oahu, Kauai, Niihau and French Frigate Shoals. Taxonomic notes: This is the species listed as Halgerda cf. graphica Basedow and Hedley, 1905 in Kay, 1979 as well as Kay & Young, 1969. 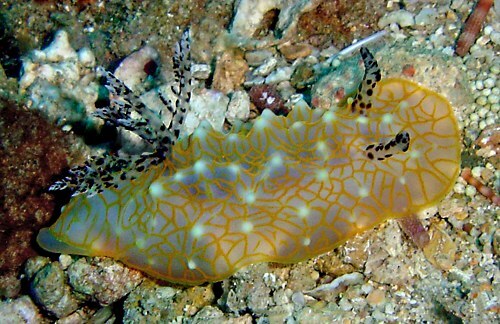 It's also listed as Halgerda sp. in Bertsch and Johnson, 1981. Its name means "looking at the earth with care," in recognition of the Earthwatch Institution volunteers who helped Bertsch and Johnson with field research on Oahu. It is referred to as the "gold lace nudibranch" in Hoover, 1998 & 2006; the "gold lace sea slug" in Hoover, 1997 and the "Earthwatch nudibranch" in Bertsch and Johnson, 1981. It was first reported in Hawaii from Ala Moana, Oahu in Feb., 1962 (Kay & Young, 1969). Photo: PF: Makena, Maui: Feb. 28, 2008.